Based on extensive interviewing and access to a wide range of databases, this is an examination of the migration career of wealthy migrants who left East Asia and relocated to Canada, Australia, New Zealand, and the United States, in the 1980s and 1990s. 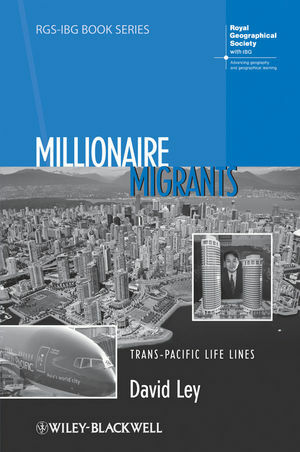 This book provides an examination of the wealthy migrants who left East Asia, notably Hong Kong and Taiwan, and migrated to Canada, Australia, New Zealand, and the United States, in the 1980s and 1990s. Through extensive interviewing and access to databases in Canada and Hong Kong over a 15 year period, Ley traces their migration career, from pre-migration, to arrival in Canada, to housing and business experiences in Vancouver, and for many, the continuing circular migration across the Pacific. The book traces the attempts of Canada to establish governance mechanisms to contain these migrants as national citizens, and the immigrants' reluctance to be contained. Considering the differential responses of men, women, and children within the family unit, the book also emphasises the role of distance, place, and space in confounding the transnational objectives of the immigrants and the globalizing aspirations of the neo-liberal state. 1 Introduction: Trans-Pacific Mobility and the New Immigration Paradigm. 2 Transition: From the Orient to the Pacifi c Rim. 3 Calculating Agents: Millionaire Migrants Meet the Canadian State. 4 Geography (still) Matters: Homo Economicus and the Business Immigration Programme. 5 Embodied Real Estate: The Cultural Mobility of Property. 6 Immigrant Reception: Contesting Globalization… or Resistant Racism? 7 Establishing Roots: From the Nuclear Family to Substantive Citizenship. 8 Roots and Routes: The Myth of Return or Transnational Circulation? 9 Conclusion: Immigrants in Space.